Mumbai: Audiences and critics are going gaga over Ranbir Kapoor’s magnificent portrayal of actor Sanjay Dutt in his biopic ‘Sanju’ but now praise for the actor is coming straight from the horse’s mouth as Sanjay Dutt praised Ranbir Kapoor saying he has been extraordinary in the film. Sanjay Dutt was interacting with media at the trailer launch of “Saheb Biwi Aur Gangster 3” along with his co-actors Deepak Tijori, Deepraj Rana, Chitrangada Singh, director Tigmanshu Dhulia and producers Raju Chadha, Rahul Mitra on Saturday in Mumbai. 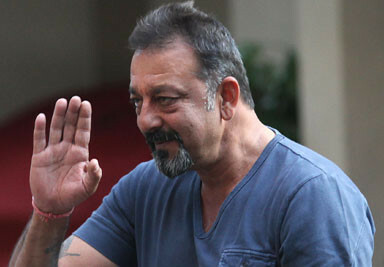 Sanjay Dutt, who has played the character of anti-hero in “Musafir”, “Plan” “Khalnayak in his career is also playing negative role in “Saheb Biwi Aur Gangster 3”. Asked how he manages every time to play the anti-hero so effortlessly that it remains in the minds of audience, he said: “Tishu (Tigmashu Dhulia) has written brilliant script and dialogues for this film but I think the character of a gangster lives within me (laughs). In “Saheb Biwi Aur Gangster 3”, Jimmy Sheirgill plays the ‘saheb’, Mahi Gill will be seen as his wife with Dutt as a gangster. With “Saheb Biwi Aur Gangster 3”, Dutt will make a comeback to characters with negative shade. It also stars Chitrangada Singh, Deepraj Rana, Soha Ali Khan, Nafisa Ali, Kabir Bedi and Deepak Tijori in pivotal roles. The film is directed by Tigmanshu Dhulia and produced by Rahul Mittra and Raju Chadha. It will hit the screen on July 27, 2018.